CSD Japanese Student Exchange from UHMed on Vimeo. The Department of Communication Sciences and Disorders (CSD) at the John A. Burns School of Medicine (JABSOM) hosted its second cultural week-long exchange program with Seirei Christopher University in Hamamatsu, Japan, on February 29. 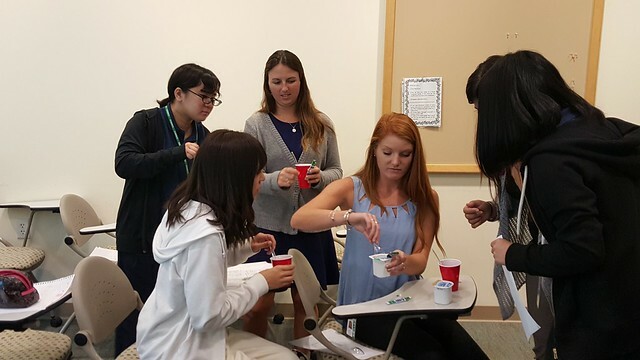 Twelve first-year undergraduate students who are majoring in speech language pathology and audiology, as well as their faculty chaperones, arrived at the University of Hawaiʻi medical school for a day of cultural activities centered in the Medical Education Building Classroom 301. For the past few months, the CSD staff has worked with the Hawaiʻi Chapter of the National Student Speech Language and Hearing Association (NSSLHA) to coordinate the exchange program, which is meant to be an educational, clinical and cultural exchange for the Japanese students and for the JABSOM CSD students. “This is a great opportunity for JABSOM as it builds the international relationship between UH and Seirei Christopher University (SCU), which is a health science-based rehabilitation university. I hope that this experience will inspire the students to be interested in graduate education, international education in US, or further their English education to become bilingual therapists,” said Dr. Jin. Although the theories, evaluation and therapy methods are similar in the United States and in Japan, there are 200 speech pathologists in Hawaiʻi primarily practice in a school-type setting, whereas in Japan, many of the child language and speech therapists work in hospitals. “So it’s a different setting, but [it’s about] how can we incorporate that into a school system, and how can we expand their minds into seeing other systems in what we do in our profession,” Jin added. The visiting students received leis upon arrival and were split into groups with the CSD student clinicians. The students were also treated to a catered lunch from nearby Highway Inn and a hula lesson at Kaka’ako Waterfront Park, to introduce them to the food and dance which are such a part of Hawaiʻi’s culture. Other highlights of the exchange included a special lecture on autism, an English accent clinic that dealt with proper English pronunciation and observations of the clinical assessments that often take place at the UH Speech and Hearing Clinic, operated in the Gold Bond Building by University Health Partners of Hawaiʻi, the JABSOM faculty practice plan. After seeing the success of both exchange programs from this year and the previous program in 2014, CSD department chair Henry Lew, MD, PhD, agreed to the idea of future partnerships with Seirei Christopher University.